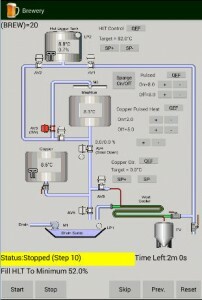 An all grain brewery controlled with an Android Nexus 7 tablet. The design of my little brewery is currently quite simple and is made to function like a real brewery to make beer from grain. The brewery consists of the following main items. 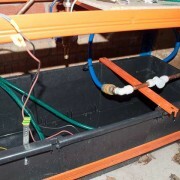 A Hot Liquor Tank for heating up the water for brewing with. A Mash Tun vessel to convert starches in crushed grains into sugars for the fermentation process. A Copper vessel for boiling the brew prior to fermentation. A Wort cooler to cool the boiled wort down to a reasonable temperature for allowing fermentation to commence without destroying the yeast. 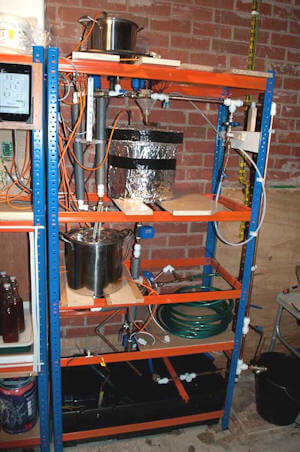 As you can see from the photo here, The system has been designed to be gravity fed like a traditional brewery would be. With the hot liquor tank at the very top feeding into the insulated Mashtun vessel below. The Mash Tun vessel is insulated so that the wort can be left in the vessel without any interaction and will keep it’s temperature within a degree or two for about an hour, The usual required time for a brew to finish converting the starch from grain into the required sugars. Above the Mash Tun is a sparging arm, This is a rotating arm which allows hot water to be sprinkled over the top the grain after it has finished mashing. The water filters through the grain which acts as a filter and carries the sugars through with the hot water into the Copper vessel below. The copper vessel is not really made out of copper, It’s just the name I’ve traditionally associated with a brew boiling vessel which in a real brewery could be made out of copper. The copper vessel is used to boil the brewed wort, among other things this renders the wort free from any bacterial contamination. After the wort has been brewed for an hour or so in this vessel, It now needs to be cooled down to allow the yeast to be added so the fermentation can commence. This is done with a wort cooler I have constructed. The boiled wort runs through a small diameter copper pipe located within the green pipe you can see in the photo. Cold water rushes up the green pipe in the other direction to the boiled wort and takes the hotness out of the wort. The final cooled wort then flows into a demijohn which has the yeast added to it, When the demijohn is full it is placed into my fermentation cabinet which keeps the correct temperature for fermentation to take place. After two weeks or so when fermentation has completed it is then bottled or put in a mini keg ready for drinking a few weeks later. This is just a quick overview of the brewery I have constructed, Further posts on the blog detail more about each part of construction. To make the brewery automatic as much as possible involves several modules and components all working together. 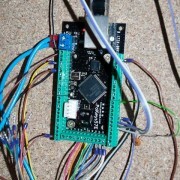 All the control pieces of the brewery such as Valves/Level Probes/Temperature Probes etc are all connected to a Pokeys57E module, this low cost module manufactured by PoLabs is a very sophisticated device and contains lot’s of communication protocols already in place to make the communication between all the parts of the brewery quite simple. 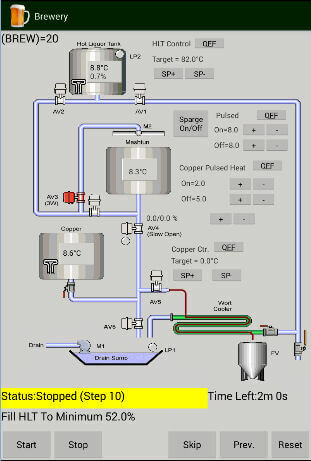 The main display which is used for controlling the brewery from the android tablet. I could have designed and programmed a board from scratch which did the same purpose but it would have taken me a long time and at the end of the day couldn’t see the reason when someone has already done all the hard work for me. And the support I’ve received from the manufacturer of the board has always been very good, with a quick response received to any email request even at the weekend. The Pokeys device itself can contain a small amount of programming to look after certain things on the brewery, I’ve used this programming capability to handle certain important things such as instantly shutting off the water supply in case the Hot Liquor Tank every reached high level, and also to turn off the Heating elements should any problem occur with the Android application. The main programming and sequence control though is done by an application I have developed to run on my Android Tablet. After developing a couple of other Android applications I though it made sense to use a tablet for controlling the brewery. 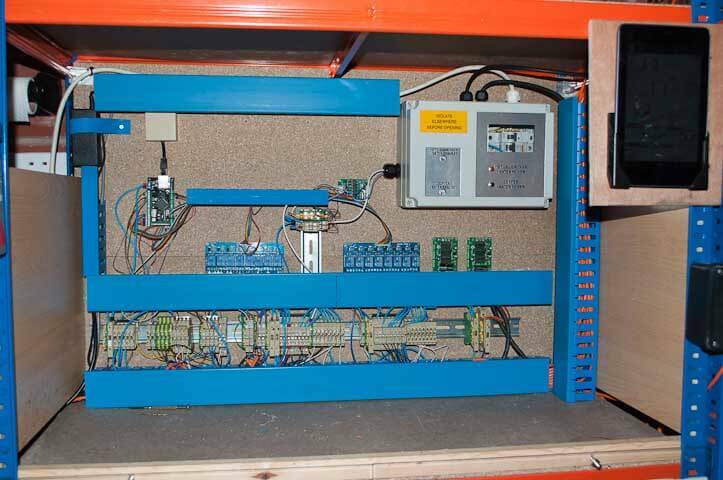 The Android application works in a similar way to how a control system works in a real full size brewery, Yet in a low cost form and is completely mobile. I’ve wired all of the devices and components together through some rail mounted connection blocks. These allow me to easily implement fuses etc and also make it easier to modify and add to the brewery in the future. On my list of things to do is to tidy all the cabling up quite and bit and put it inside trunking. More information on all the parts here and how I’ve used them are detailed in my other blog posts.